The prospect of better health is a major reason for quitting, but there are others as well. Smoking is expensive. The economic costs of smoking are estimated to be about $3,391 per smoker per year. Do you really want to continue burning up your money with nothing to show for it except possible health problems? Smoking is expensive. It isn't hard to figure out how much you spend on smoking: multiply how much money you spend on tobacco every day by 365 (days per year). The amount may surprise you. Now multiply that by the number of years you have been using tobacco and that amount will probably astound you. Multiply the cost per year by 10 (for the upcoming 10 years) and ask yourself what you would rather do with that much money. And this doesn't include the higher costs for health and life insurance, as well as the possible health care costs due to tobacco-related conditions. Smoking is less socially acceptable now than it was in the past. While decisions may not be based entirely on social acceptance, most workplaces have some type of smoking restrictions. Some employers prefer to hire nonsmokers. Studies show smoking employees cost businesses more to employ because they are "out sick" more frequently. Employees who are ill more often than others can raise an employer's need for expensive temporary replacement workers. They can increase insurance costs both for other employees and for the employer, who typically pays part of the workers' insurance premiums. Smokers in a building also typically increase the maintenance costs of keeping odors at an acceptable level, since residue from cigarette smoke clings to carpets, drapes and other fabrics. Landlords, also, may choose not to rent to smokers since maintenance costs and insurance rates may rise when smokers occupy buildings. Friends may ask you not to smoke in their houses or cars. Public buildings, concerts, and even sporting events are largely smoke-free. And more and more communities are restricting smoking in all public places, including restaurants and bars. Like it or not, finding a place to smoke can be a hassle. Smokers may find their opportunities for dating or romantic involvement, including marriage, are largely limited to only other smokers, who make up only about 1/4th of the population. Smoking not only harms your health but the health of those around you. Exposure to secondhand smoke (also called environmental tobacco smoke or passive smoking) includes exhaled smoke as well as smoke from burning cigarettes. Studies have shown that secondhand smoke causes thousands of deaths each year from lung cancer and heart disease in healthy nonsmokers. Smoking by mothers is linked to a higher risk of their babies developing asthma in childhood, especially if the mother smokes while pregnant. It is also associated with sudden infant death syndrome (SIDS) and low-birth weight infants. Babies and children raised in a household where there is smoking have more ear infections, colds, bronchitis, and other respiratory problems than children from nonsmoking families. 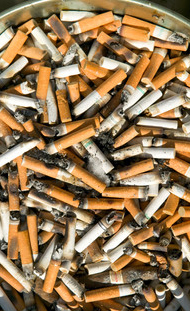 Secondhand smoke can also cause eye irritation, headaches, nausea, and dizziness. If you have children, you want to set a good example for them. When asked, nearly all smokers say they don't want their children to smoke, but children whose parents smoke are more likely to start smoking themselves. You can become a good role model for them by quitting now.